Client: Study performed by Dr Pierre Alusta during his PhD research at the University of Arkansas Little Rock, using a commercial Analyze IQ Lab license. Objective: To identify unknown bacillus samples rapidly and reliably, including potentially harmful bacteria in a complex matrix such as airborne dust. The client developed a novel technique, Direct Impact Ionization, to ionize bacteria and obtain mass spectra. Chemometrics was required to positively identify bacteria from their mass spectra. In Analyze IQ Lab, one model was built and tested for each of the bacilli, using Principal Component Analysis with Linear Regression. The unknown was not included in the training set. A total of 19 models were applied to identifying the unknown bacillus sample. 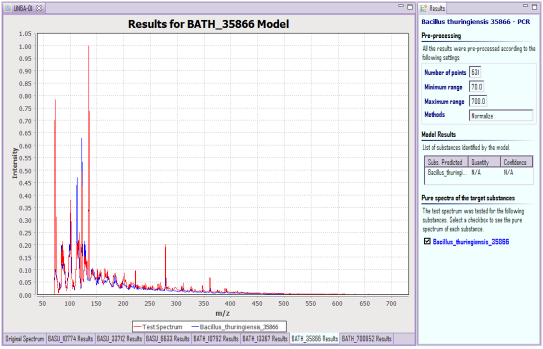 Result: Unknown samples’ spectra were analyzed and correctly identified rapidly with Analyze IQ Lab. To confirm the results, traditional determination methods were used in a microbiology lab, re-growing the unknown bacilli and the match found by Analyze IQ Lab on agar plates for two days and comparing the cultures (Alusta 2012). The new methodology using Analyze IQ Lab was also evaluated for the task of detecting and identifying potentially harmful bacteria in a complex matrix such as airborne lab dust (Alusta 2012). Again, results were positive. Robust Results: "Analyze IQ Lab™ v.2.0 software yielded robust results", whereas attempts with one alternative package "looked promising at best", and another "failed to provide numerical output describing close relatedness of data sets" (Alusta, 2012). Ease of Use: Analyze IQ Lab’s user interface "is straightforward and allows the investigator to oversee the entire analysis". Conversely, a popular competitor is described as having a "highly-confusingly organized workflow", requiring "a steep learning curve" and "help support is meager, if at all present." (Alusta, 2012). Overall: "The user-friendly Analyze IQ Lab yields robust results and has become an integral tool in our reserch lab" - Dr Pierre Alusta, Little Rock, AR. Reference: Alusta, P.: “Rapid Identification of Bacteria Using Mass Spectrometry and Spectral Pattern Recognition”, PhD Dissertation, University of Arkansas at Little Rock, 2012. Information in this case study is reproduced with permission.